Grab a fork and a napkin, because Apple Pie day is coming this May 13. Talk about a holiday you can really sink your teeth into! Apple pie has been around since the Middle Ages. A Dutch cookbook dated 1514 lists a recipe for Appeltaerten. It called for a standard pie crust, slices of soft seedless apples, and a few tasty spices—specifically cardamom, ginger, cinnamon, nutmeg, clove, mace, and sugar—all cooked up in a traditional Dutch oven. The English also had their version of apple pie, which dates back to the time of Chaucer. The English version also suggests adding figs, raisins, and pears to the apple-and-spice mixture. In Sweden, apple crumble was the gold-standard. Traditional Swedish apple crumble requires breadcrumbs or rolled oats instead of pastry, and is served up with custard or ice cream. In France, apple pie is served upside-down as a tarte tatin. The French also caramelized their apples, an innovation which added a whole new dynamic to the flavor. They were also the ones who decided to add cheese to their pies, which actually makes for a surprisingly delicious treat. In the 17th century, apple pie was finally brought to the American colonies. Over time, apple trees (which were not native to the Americas) began to grow, which made baking much easier. Now, apple pie has become an indelible part of the American identity, to the extent that apple pie is considered one of the most American things in the world. Any good cookbook will no doubt have an apple pie recipe in its dessert section. Follow the recipe to the letter or improvise — whatever sounds like the most fun. There are even dedicated apple pie cookbooks, such as Ken Haedrich’s Apple Pie. Pick the one that sounds the yummiest and have some fun! Since there are so many different ways to make apple pie, there’s a chance that you haven’t tried your favorite kind yet. Get a few friends together and set a challenge to each bake a different apple pie. When you’re all done, get together and do a taste-test. See which baker comes out on top! If you don’t happen to be in a baking mood, you can always go out to get apple pie. Make a list of all the restaurants in your area that serve apple pie, get a group of friends together, and go out on the town in search of the very best in apple pie. Even if baking isn’t your style, you can still get “pie” with a little help from your friends. The wonderful thing about an apple is that the taste is so neutral that it lends itself to all sorts of spices. Not only does this give the brave chef room to experiment, but it also presents a delicious opportunity to any self-proclaimed foodie. They’re a perfect warming treat on a cold day, but they also pair perfectly with a cold dish of ice cream. 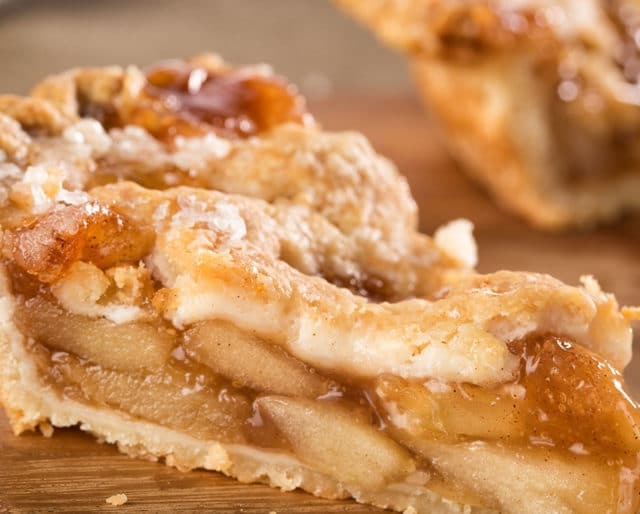 While it is true that apple pie was not originally invented in America, it has become so much a part of the national identity that you can’t help but feel a little more American with every bite. Not only that, but the various influences on apple pie represent cultural collaboration and innovation, which represent American ideals at their very finest. If you want to make an apple pie, all you really need is a pie pastry, a few sliced apples, cream, and spices. You can make it a little fancier if you want, but you don’t have to search far and wide for delicious ingredients, either. And despite its basic nature, apple pie is almost universally loved, so it’ll be a guaranteed crowd-pleaser at your next dinner party.